I don't know who this man is but he is the ultimate patient husband. 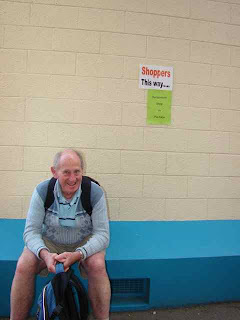 he was waiting for his wife to finish shopping in the merchants mall at the Wellington Quilt Symposium. Above him is the sign pointing to shopping. 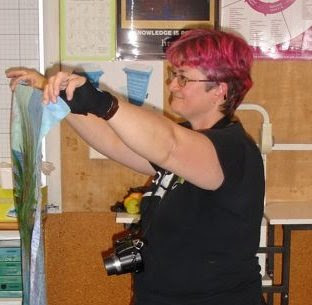 I am holding up someone's 'spiky tree' top they have made in class at the Wellington Quilt Symposium. I have finished teaching now and tomorrow I will take a class with Ann Fleeton. Tonight there was a marvellous talk by Libby Lehman about organising your sewing room. Her room was so organised that after a while I felt like banging my head against the seat in front. It was very humorous but mission impossible for me.